Home Desert Road Trippin Day Trips Numbered Series Day Trip #4: Coyote Canyon 4WD Trail In Anza-Borrego Desert State Park. Day Trip #4: Coyote Canyon 4WD Trail In Anza-Borrego Desert State Park. Click image to view video of Coyote Canyon 4WD Trip by DesertUSA.com. Click here to view the video that corresponds to this road trip into Coyote Canyon. Water in the desert is scarce and oases are rare. When you do encounter a stream or spring in the middle of an arid region, it is a natural wonder. Coyote Canyon, located in the northwest area of Anza-Borrego Desert State Park, is one of those places. There is a year-round stream that runs through the canyon and serves as a water source for the bighorn sheep and other wildlife. Diverse riparian flora and fauna flourish along its banks. I have visited Coyote Canyon in the summer months over the past ten years, and have been surprised to see a little water running in the stream. After the heavy rains we received in December of 2008, I thought it would be fun to take another day trip out to Anza-Borrego Desert State Park to see how Coyote Canyon fared during the winter months, and to see if I could find evidence of early wildflower blooms. Jim, Publisher of DesertUSA.com, hiking up to tape the view above the Desert Gardens. On New Year’s Eve ‘08, I ventured out to Coyote Canyon. 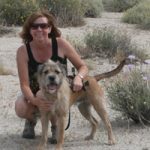 It was the first time I’d been to Anza-Borrego on a holiday weekend, and I was surprised to see four or five other groups of vehicles on the road in Coyote Canyon along with us. We started our journey along the dirt road that takes you into the Canyon, and shortly after, stopped at the Desert Gardens. There was a dirt parking area, along with several picnic tables and an informational kiosk. I hiked up a small hill nearby and took several photos of the surrounding garden views. A forest of ocotillos, some with new green leaves with red blooms was visible. I found one chuparosa bush in bloom and several other types of plants green with new growth. 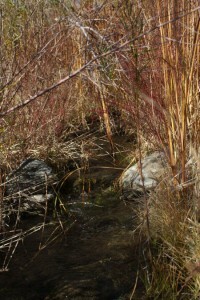 After our brief stop at the Desert Gardens we continued on to the first stream crossing, which was dry. It is recommended that only 4WD vehicles continue past this point. I was surprised that the stream crossing was dry when just a couple weeks earlier this area had received heavy rain. There was little evidence of rain or water until we reached the second crossing. Water at the second crossing. At the second crossing, the stream was flowing across the road. I got out of the Jeep and explored the riparian area that flanked each side of the track. The water was not deep at this crossing and was easy to navigate with a 4WD vehicle. Grass, bushes and other plants were abundant along the banks, creating a riparian habitat. It was difficult to see the watercourse with all the overgrowth except for the section where the road passed through it. Vegetation was thick, creating a green ribbon that cut through the canyon. To see footage of our Jeep crossing the stream, click on the video linked at the beginning of this article. 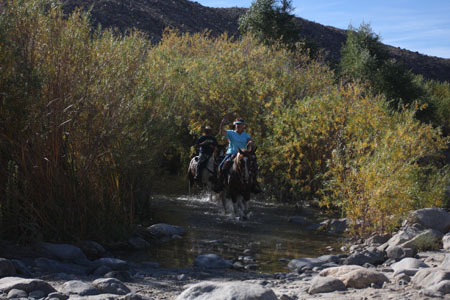 Between the second and third crossing we encountered several groups of horseback riders. It was the first time I had encountered riders in the desert, reminding me of a Hollywood Western. The Vernon V. Whitaker Horse Camp is located just southeast of the main trail entrance. 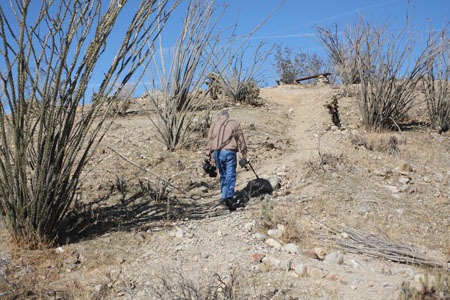 There are trails from the Camp that riders and hikers use to reach Coyote Canyon’s trail system. At several points the riding trail joins the road and then branches off again to a separate riding and hiking trail. At the third crossing, the water was deep and the road completely submerged. The track of the road ran along the stream’s course for several hundred feet and passed through a tunnel of brush and trees. Beyond the third crossing lies a very rough passage. As that was more than we were up for that day, we decided to park and have lunch. While we were there, another group of horseback riders emerged from the tunnel that housed the crossing. For footage of the riders at the third crossing, please view our video which is linked at the top of this article. Horseback riders emerging from the third crossing. From Christmas Circle in the town of Borrego Springs, CA take DiGiorgio Rd. It will dead-end at the dirt road that takes you into Coyote Canyon. There are three clusters of willows that grow along the stream: the lower willows, middle willows and upper willows. The canyon is closed from the lower willows to Terwilliger areas between June 1st through Sept. 30th. This seasonal closure protects the watering areas for the bighorn sheep and other wildlife. The route through Coyote Canyon has three water crossings and requires 4WD after the first crossing to navigate the more difficult sections. The trail becomes increasingly difficult right before and after the third crossing. Make sure you check with the Park’s Visitor Center for reports on the Coyote Canyon Road and ask about the current conditions prior to travel. Next articleDay Trip #5: Touring the Big Boulders at Joshua Tree National Park.